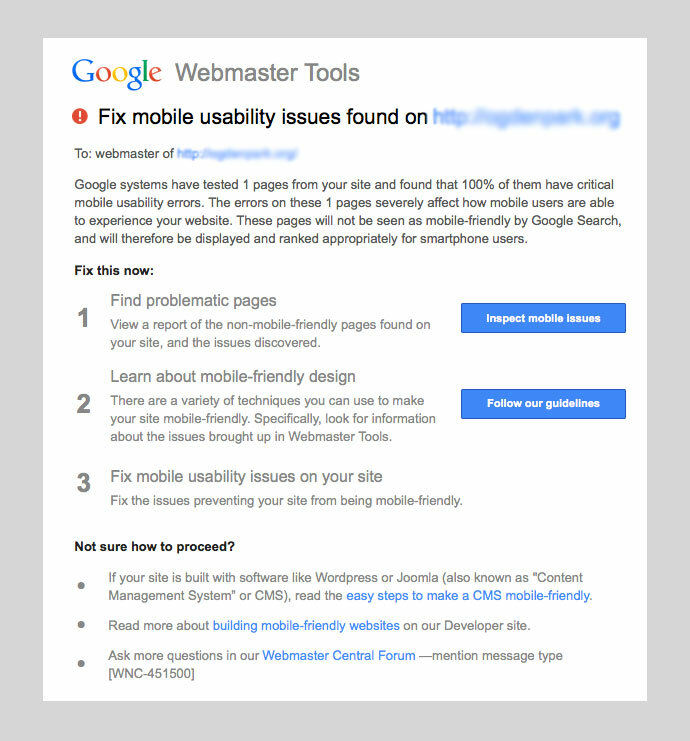 Think Google doesn’t care if your website is “mobile-friendly” or not? Think again. Checking up on some metadata changes I had made a few days ago, I noticed that Google is clearly indicating whether a website was built for mobile in their mobile search results pages. In both Safari and Chrome on the iPhone the text is a dark gray color so it’s fairly noticeable. I highlighted the indication in red below just in case you’ve missed it. I did a little digging and apparently in the last recent months Google has been experimenting with showing an icon of a mobile device with a slash through it to indicate that a site was not mobile-friendly. Now they are now showing which ones are optimized for mobile, which makes more sense since most sites are not. I’m a little surprised that Google would dedicate 15 characters in an already tight UI space, but I do enjoy and appreciate the feature. I’m using older phone and my connection is pretty slow, so having some sense of how fast a site will load and how readable it will be is definitely a factor when choosing which result I’ll pick. We already know that Google rewards websites that load fast because they provide a better user experience, and mobile is no different. I’ve mentioned in a previous post that mobile browsing is quickly surpassing desktop browsing based on most of the Web analytics that I look at. 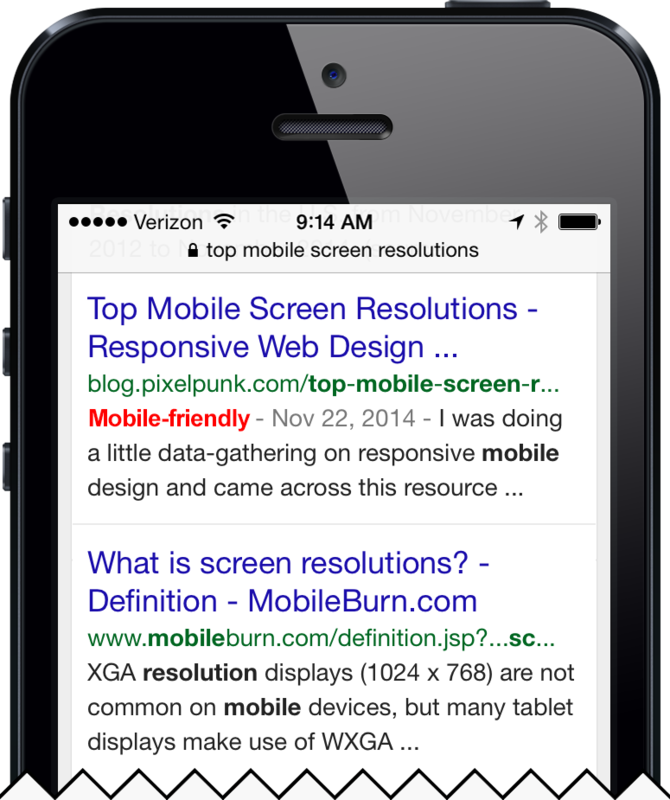 And speaking of search results on mobile devices, Google also shows different results depending on if you are on a mobile or on desktop, so one can assume that if your site provides a better user experience by being optimized for a small screen, you may rank higher than a competitor that does not. The fact that Google has added mobile usability reporting to it’s Webmaster Tools is yet another indication that mobile optimization will soon become a standard ranking signal…I assume it already is. 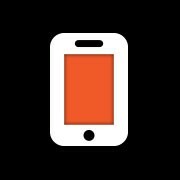 They’ve also created a Webmaster’s Mobile Guide and Mobile-Friendly Testing Tool to help you get started. UPDATE: As if on queue, I received an email from Webmaster Tools today indicating that a website I own was not mobile friendly and steps that I need to take to correct the errors (screenshot below). I was playing around with Responsive Google Map Mashups and learning about Geographic Information Systems (GIS) this morning. As an experiment, I mapped out the four store locations of my client, F. Oliver’s Oils and Vinegars in Google Maps. You can click on the title header to reveal (and hide) more details, and each individual pin can contain it’s own unique title, description, driving directions, URL, and a photo. You can even add your own unique “pin” icon…I added an icon of one of her EVOO bottles. Super simple, and no access to Google API keys required. Out of the box, Google’s embedded map snippet is non-responsive, but it’s easy enough just to wrap a DIV around it to fix that. I added the code inline right here within the WordPress editor, but best practice would be to add the following CSS rule to your website’s stylesheet. I did notice that the photos within each pin do not resize, so on my iPhone the photo entirely fills the screen and renders the map almost unusable. I did leave the photos in (above example) for illustration purposes, but in a production environment we would need to design something more useful for smaller mobile devices. Next up….Advanced Map Mashups using Excel spreadsheets and Google Fusion Tables.